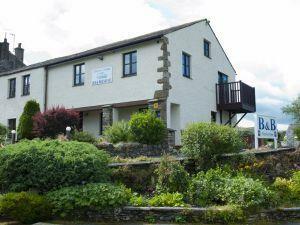 A 4 star self assessed establishment (Tina is trained to visit Britain standards to assess), Primrose cottage is Ideally positioned for access to the Lake District, Yorkshire dales, Howgill hills and the Durham dales. Twin divan beds, flat-screen TV, biscuits, tea and coffee. Shower, wash basin and loo. Bath sheets, toiletries and hairdryer. Free Wi fi. King size bed. 2 x single seat armchairs for watching TV. Newly installed modern shower room. Large wardrobe and hairdryer. Flat-screen TV and free wi-fi. small folding bed for small children. Exit M6 Junction 38. Turn right at the roundabout and we are the 1st house on the right. Cant fault anything about our stay. Owners were extremely good hosts and made us feel comfortable. We will definitely recommend to friends and come back again. Thank you for your lovely review Nancy and we are glad you enjoyed your stay at Primrose cottage B&B. Want to advertise on Roomcheck?